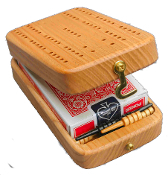 This cribbage board is made of a solid piece of hardwood. Fold up the board and store the cards and pegs in side. This makes a great game to take with you anywhere you like to play. Includes 6 pegs and 1 deck of plastic coated playing cards. Folds to 4 1/2 inches x 3 3/4 inches x 1 1/2 inches thick. Opens to 9 inches x 3 3/4 inches x 3/4 inches thick.